Depending on what side of the family we are spending Christmas with or what our plans end up being otherwise, we will sometimes forego the traditional Southern Christmas and instead have a Cajun Christmas! Cajun Christmas traditions are celebrated somewhat in our household every season but some years we go all out and go full blown Cajun. 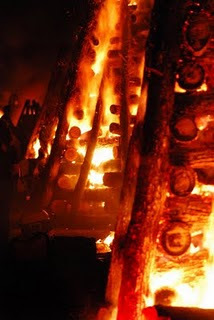 We have some wonderful Louisiana traditions that may seem crazy to the rest of you and are very different than the way you celebrate Christmas yet, they are so incredible and unique! Instead of Santa Claus we have Papa Noel. 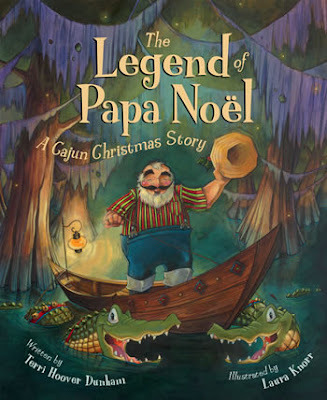 Papa Noel lives down in the hot, humid, swampy bayou of Louisiana. 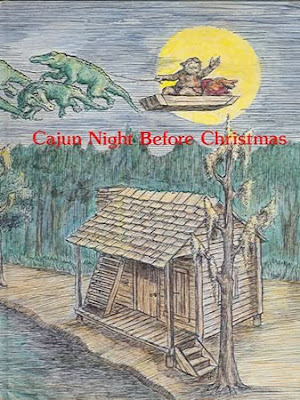 He's a Cajun legend and you'll often find momma’s (Mère’s) and daddy's (Père’s) reading such books as The Legend of Papa Noel or Cajun Night before Christmas on Christmas Eve. 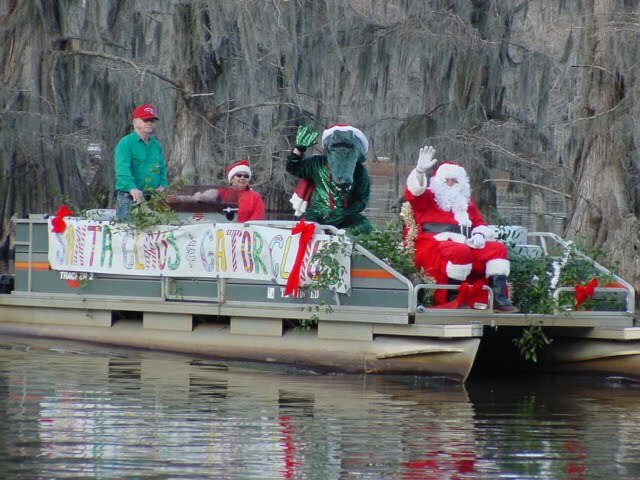 While Santa is pulled in his sleigh by eight reindeer, Papa Noel is pulled in a Pirogue (pro: Pea-row) by eight alligators: Gaston, Tiboy, Pierre, Alcee, Ninette, Suzette, Celeste and Renee. 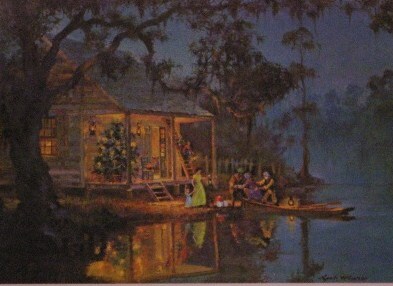 On Christmas Eve we follow a tradition dating back hundreds of years....the lighting of bon fires on the levees of the Mississippi River and in the bayous to guide Papa Noel and his alligators to the swamp to deliver gifts to our children in Bayou Country. Christmas in South Louisiana is so unique and magical with the Cajun decorations, traditions, food and Christmas Zydeco and Jazz music. The following are a few of our traditional Cajun dishes we serve at Christmas. Melt butter in large casserole dish and add all ingredients except lemon. Cut lemon in half and squeeze juice, add to mixture. Bake in oven at 350 until done. 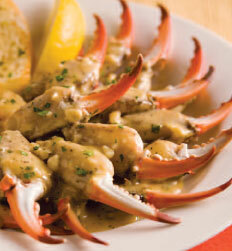 Serve in large soup bowls with lots of sauce and toasted french bread for dipping. Additionally, we also have dishes from previous posts such as Crawfish Stew, Creole Crawfish Etouffee, Shrimp Creole, and Spinach Madeline. And, of course, we have a smoked or fried turkey! 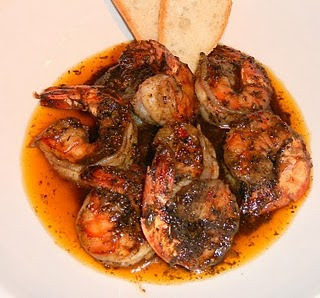 That barbecued shrimp looks amazing! I cannot wait to try it. Thanks for one's marvelous posting! I actually enjoyed reading it, you happen to be a great author.I will always bookmark your blog and may come back in the foreseeable future. I want to encourage that you continue your great writing, have a nice weekend! my mother started a tradition a few years before she s passed from breast cancer of always have a themed christmas. the first was a cajun christmas, well this year my nephew justin be deployed in january 2014, so he be home for two years so he chose cajun christmas for 2013. i will be checking back for more ideas!!!! Congratulations, excellent blog post. 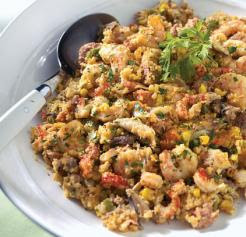 We will have a very Cajun Christmas dinner this year, here in Caracas, Venezuela. I lived in Lafayette , Louisiana 5 years. If you ever tasted it you would be astonished. Anyone know who the artist is for the santa and crawfish pictures? Where is the photo of Gator Santa in the boat from?